Once upon a time, I began a project to read a book on every president from George Washington through Bill Clinton. At the time, Obama was still president, and I didn’t think reading about Bush, out of office less than eight years, or Obama, still sitting, would afford me a very objective view of their terms. Plus there was the real possibility that Hillary Clinton would cloud any view of her husband’s tenure. 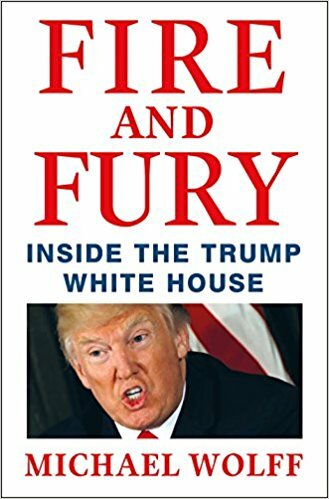 Michael Wolff’s controversial expose of Donald Trump’s presidency, Fire and Fury, is never going to be mentioned in the same breath as anything by Joseph Ellis or Walter Isaacson, nor A Team of Rivals or anything by Bob Woodward. But having read the diaries, interviews, and letters of Gerald Ford, Ronald Reagan, and George HW Bush, Wolff has made it clear this White House is a disaster. It should be pointed out that Fire and Fury is sloppily written and in dire need of fact checking. Wolff gets a few dates and names wrong, the most glaring error being John Boehner’s departure from the House, 2015 instead of 2011 as Wolff asserts. And some depictions of moments with Trump and his advisers are purely speculative without any attribution to the source. That said, there is enough attributed and anonymous sourcing to paint a portrait of a White House in disarray. Trump is a salesman and a celebrity, but these do not a president make. Most of Wolff’s information comes from chief strategist and Breitbart editor Steve Bannon. Bannon took the job with Trump’s campaign when everyone concerned was convinced that Trump would lose, including Trump. The endgame was not the White House. It was to raise Trump’s profile enough to start a new television network that would rival Fox News, already spiraling because of the firing of Roger Ailes and an ideological tug of war between Rupert Murdoch and his sons. Wolff compares the Trump campaign to the two scheming protagonists in Mel Brooks’ The Producers. In the movie, Max Bialystock and Leo Bloom sell 100% of their awful musical several times over, banking that they’ll never be found out because no one would ever want to see a musical called Springtime for Hitler. Likewise, no one in the Trump Organization expected Trump to win, allowing them to cash in on Trump’s run and possibly painting him as a martyr to “crooked Hillary.” But like Max and Leo, who were ruined when their play became a hit, Trump won. Uh-oh. ﻿ But the most unflattering portrait in this tale is of Steve Bannon, the source of much of Wolff’s information and, perhaps unwittingly, his own worst enemy. Bannon badmouths his former boss so many times that, as this book came out, even Breitbart, the notoriously and unabashedly biased right-wing web site, cut him loose. Many have commented on Bannon’s disheveled appearance and lack of organization, which he considered a strength. As it turns out, Bannon was completely disorganized and more interested in preserving his position than leading some sort of nationalist movement which he now finds himself outside. What emerges is a battle in the West Wing between professionals, represented by Trump’s own cabinet, chiefs of staff Reince Priebus and John Kelly, and even most of Congress, rank amateurs like Steve Bannon and Anthony Scaramucci (whose rise to power would be tossed out of most editor’s slush pile in a novel), all of whom had to contend with the Trump family. Moreover, at the eye of this storm is Donald Trump, a man with a short attention span, zero political experience or talent, and no understanding of the job he has taken on. Wolff is a sloppy journalist, but then maybe it takes a sloppy journalist to expose a very sloppy president.